Know what our clients said about our trips! Langtang is one of the three most popular trekking regions of Nepal.This trek combining Langtang valley and the nearby Gosainkund lake is an unique itinerary that offers all the best of the region in a single trek. The Langtang valley and Gosainkunda can be done as separate treks too. This trek offers a face to face with high mountains and glaciers within a short time frame and also gives an opportunity to see pristine Gosainkunda lake. Our trek passes through culturally rich Buddhis villages mostly Inhabited by the Tamangs and the Sherpas and will have opportunity to see some beautiful, old gompas and Yak herds.In the summer each year the valley floors of Langtang offer a real spectacle of blooming primula, poppy and iries and is an ideal place to see alpine flowers. The trek starts with an 8 hour jeep ride to Syabrubesi.The trek passes through ethnic Tamang villages , forests and many yak pastures. Walking along the langtang Khola valley we reach the interesting Kyanjin gompa on the fourth day. 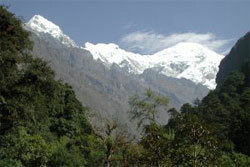 Next day we explore the Langtang valley and visit the glaciers. After Langtang we head for Gosainkunda. Along the route we enjoy great view from Laurebina. We stay by the lakeside lodge to enjoy the pristine beauty of this alpine lake. We cross the Laurebina pass at 4610m and descend to the Sherpa village of Helambu.Before catching our vehicle from Sundarijal, we enjoy yet another mountian view from Chisapani. Back in Kathmandu we will celebrate your memorable trip with a farewell Nepali dinner with ethnic cultural show. Price: All our trips are tailor made trips with personalized services. In order for us to quote you the price, please write us with the number of persons in your group, your choice of hotels and ammendments in our itinerary, if any. Our prices are very reasonnable for the services we provide. Note: Jeep to Dhunche/Syabrubesi can be arranged for groups above three pax. For groups upto 3 pax we will arrange bus tickets. We are affiliated with Nepal Tourism Board, Govt. of Nepal-Tourism Ministry, Nepal Trekking Company Association, KEEP & NMA.